Although it somehow doesn’t seem like that long, it was actually January 2007 when I last wrote a post about my 009 layout Fairlight – theoretically the subject of this blog. Since then I’ve been side-tracked by other projects (including fatherhood) but truth be told I was becoming a bit disillusioned with the running quality of my stock – especially over the turnouts where power continuity through the point blades was intermittent at best. So, late August 2008. I recently bought a Roco HOe outside frame loco at a good price, these engines are becoming popular for 009 conversions as the frames are ideal for many UK narrow gauge prototypes and the quality of the mechanism is pretty much unparalleled in this scale. It needed a test run, of course, so I tried it out on Fairlight. Even on dirty, neglected track it will crawl without a stutter, but had the usual problem with the turnouts. I took the loco to a Sussex Downs 009 club night and had it run in for a while on the test track, again it was very smooth and controllable. Inspired by this, I was resolved to take drastic action if necessary to get Fairlight up to scratch. So I’ve spent my evenings this weekend pulling up the turnouts in the station area and adding manual frog switching in order to improve power flow. The modification is easy to do on Peco 009 turnouts, which by default transmit power to the frog through the blade rails. Theoretically this should give a clean contact but if any dirt (or paint, if you weather the track) gets in the gaps it can cause the kind of problems I’ve experienced. 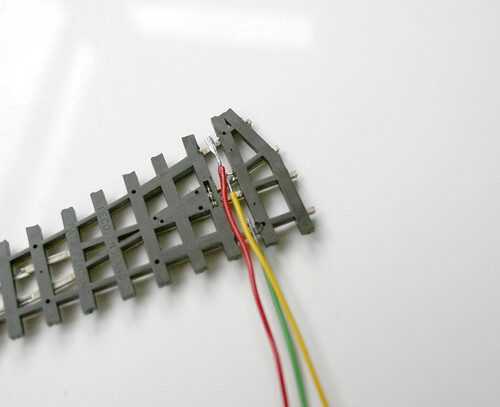 The solution, pictured above, is to wire the frog (or crossing vee) directly to the stock rails through a switch. To solder the wires to the bottoms of the rails I needed to cut away some of the sleeper webbing, but this doesn’t affect the strength of the point. This has the effect of ensuring power is sent reliably to the right place, but you must make sure the switch is switched when the turnout is thrown or it will cause a short circuit. If you’re using a point motor you can usually run these wires to an accessory switch, however Fairlight uses wire-in-tube control and so I’ve also ‘decommissioned’ the previous operating levers (the GEM Mercontrol type) and instead will be using miniature SPDT slide switches for both the throw and polarity switch. By drilling a small hole in the switch toggle you can feed the operating wire through and use it as the lever. Obviously this has caused some disturbance to the layout, I will have to re-fix and re-ballast all the turnouts to get back to where I was. However the difference in running is just what I needed, even my more hesitant locos are now able to run through the turnouts and beyond without any problems. The first one I replaced was with a completely new point I had in stock, but I have since been able to clean up and re-lay the existing ones and they’re all just as good. 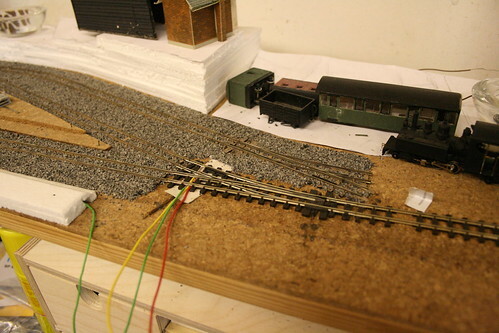 I’ve also taken the opportunity to clear out the previous wiring ‘fix’ and lay new, thicker wire to the track feeds in anticipation of moving to DCC control one day. My target for the weekend was to re-lay all four turnouts in the station and be able to run a train (hauled by the new loco!) in and run around. Well, there’s still a lot of work to do, but I now have four re-wired points and that train movement I promised myself was carried out earlier this evening – at a lovely, smooth, controllable pace. I’m fired up now about moving on with Fairlight, and hopefully blog updates will continue to appear as I find the time to work on the layout – the next target after this little phase will be to start laying track on the next board. As for the loco, I’m thinking of using it under the Parkside kit for the Welshpool & Llanfair’s ex-Sierra Leone Hunslet, but it’s so nice as it is that so far I haven’t been able to bring myself to even open it up! 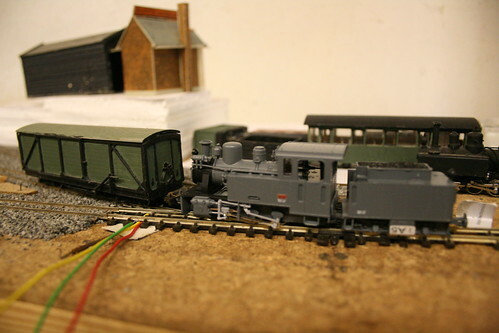 This entry was posted in 009, fairlight, layout, model railways, narrow gauge, wiring. Bookmark the permalink.